Was “Aquenackwe” Little Turtle’s Father? Was “Aquenackwe” Little Turtle’s father? Probably not. Like many Myaamia (Miami) children, I grew up with stories of family genealogy. One common story that I heard was that my family descended from Little Turtle’s sister, Tahkamwa (Maria Louisa Richardville). In family genealogies, Little Turtle and Tahkamwa’s father was always listed as “Aquenackwe” or “Aquenackqua” sometimes with the English “The Turtle.” Later in life, as I began learn to speak our heritage language and started to investigate historical documents for myself, I learned how much confusion there was around this name and how small mistakes, made by amateur American historians, spread this confusion far and wide. The confusion began in the late 1800s, as early midwestern historians misread an already poorly recorded version of the name Mihšihkinaahkwa. Through a series of errors in hearing and writing, this common Myaamia name was replaced by “Aquenackwe” in the historical record. This elder Mihšihkinaahkwa was born sometime in the early 1700s and died sometime in the mid to late 1700s. The younger Mihšihkinaahkwa, who would become famous as the Myaamia war leader called “Little Turtle,” was born around 1750 and died in 1812. These two men may have been father and son, but there is substantial doubt around that point as well. The story of how the name of the elder Mihšihkinaahkwa became confused as “Aquenackwe” is an interesting one that shines a light on the difficulties that historians have had understanding Myaamia names and kinship. The central problem with this claim is that the word “Aquenackwe” (or Ahkinaahkwa in the modern spelling) does not have any stand-alone meaning in the Myaamia language. So where did the name come from and what does it mean? To track the origins of this name down, we have to go back to one of the oldest treaties Myaamia people made with English speaking Europeans: the 1748 Treaty of Lancaster (Pennsylvania). Every reference to “Aquenackwe” gives this treaty as the original source for the name. 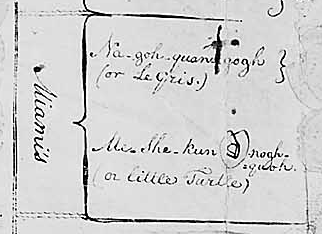 However, the actual transcript of this Treaty lists this man’s name as “ciquenackwa.” At some point, probably in the late 1800’s, someone accidentally wrote an “a” in place of the “ci.” This is an easy mistake to make if the person taking notes is in a big rush, does not know the Myaamia language, and does not cross reference their conclusions. At first glance, “Ciquenackwa” is just as confusing as “Aquenackwe” until you ask linguists, like Dr. David Costa and Daryl Baldwin. David and Daryl both point out that it was quite common for English speakers to not hear the “mi” on the front of words if it was spoken in a breathy manner. Taking that point into account gives us the name “Miciquenackwa,” which in our modern spelling is Mihšihkinaahkwa. This conclusion is confirmed by looking at a the record of meeting in 1753 attended by the same group of Myaamia people who signed the 1748 Treaty of Lancaster. At the end of the 1753 council one of the attendees is listed as Micheguenotha, which is another common Anglicization – English transformation – of Mihšihkinaahkwa. So how did this older Mihšihkinaahkwa (1700s-1750s) have his name so thoroughly replaced by “Aquenackwe” in history books and genealogies. Like a lot of historical confusions, this one seems to be a case of one or two people making a simple mistake, like changing a “ci” into an “a.” The mistake spread as it was read and quoted by many historians, genealogists, and lawyers. The earliest reference that I have found to “Aquenackwe” in an English text is in the 1887 History of Miami County, published by Brant & Fuller (If anyone has an earlier English reference, or an even older French reference, I would love to see it). It is quite likely that the authors of this work were not the first to make this mistake. From the 1880s through the early 1900s, county histories were produced by publishing houses as rapidly as possible in order to sell for a profit. Facts, biographies, and basic historical information in one county history were usually copied into the histories of other geographically contiguous counties. As a result, historical mistakes spread very quickly in this era of pre-professional history. So what of the conclusion that the older Mihšihkinaahkwa (1700s-1750s) was the father of the younger Mihšihkinaahkwa (~1750-1812)? Currently, we do not have a lot of evidence to prove or disprove this hypothesis. We can say that it was not very common for fathers and sons to carry the same Myaamia name in that period of time. The French sometimes referred to fathers and sons with the same French language nicknames, like “Le Gris” and “Le Petit Gris.” But this is not necessarily reflective of Myaamia naming practices. It more likely reflects Euro-centric beliefs that sons carry on their father’s legacies through naming. In European cultures most children carried their father’s surname and at least one male child usually carried the father’s given name. In the Treaty of Greenville (1795), the younger Mihšihkinaahkwa (Little Turtle) described the building of the Myaamia fort at Pinkwaawilenionki (Pickawillany). In the transcript of the treaty Mihšihkinaahkwa says,” it was a fort built by me.” In his biography of Little Turtle, historian Harvey Lewis Carter makes a very good argument that he probably said, “it was a fort built by Mihšihkinaahkwa.” Carter argues that the translator and or transcriber substituted “me” in place of the given name in the mistaken belief that Little Turtle was talking about himself. Carter takes his hypothesizing a step too far, however, when he argues that the Mihšihkinaahkwa, who built the fort at Pinkwaawilenionki in 1747, was the father of the well-known Mihšihkinaahkwa (Little Turtle), who was a key leader in the victories over Generals Harmar and St. Clair as well as a leading speaker at the Treaty of Greenville. 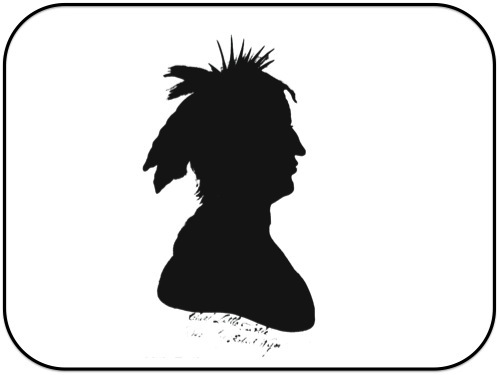 This silhouette was reportedly made of Mihšihkinaahkwa at some point during the 1790s. The only verified portrait of Mihšihkinaahkwa was destroyed when the White House was burned by the British in 1814. The use of kinship terminology was extremely common in treaty negotiations in this time period, and the younger Mihšihkinaahkwa referred to his Myaamia ancestors as “forefathers” throughout his speeches. Yet, when he spoke of this older Mihšihkinaahkwa, he apparently did not use the term “father” or make any other kinship reference to this man. This is highly unusual, as kinship references were the preferred and most common means of referencing family. The younger Mihšihkinaahkwa (Little Turtle) gave numerous other interviews in his lifetime and lots of other Myaamia people recounted versions of his genealogy, yet there are no primary source references to this father-son relationship between the two men (if anyone has a primary source reference to this relationship, I would love to see it). This lack of evidence is not definitive proof of anything, but it does seem to make it unlikely that there was a close family relationship between these two men who both carried the Mihšihkinaahkwa name. Ohio Department of Natural Resources states that the painted turtle is one of the most numerous turtles in Ohio. Harvey Lewis Carter argues for the father-son relationship in interpreting the “Little.” see Carter’s The Life and Times of Little Turtle: First Sagamore of the Wabash (Urbana: University of Illinois Press, 1987), 32. Daryl Baldwin suggested that the painted turtle species may have been referred to colloquially in English as “the little turtle” because it is smaller on average than the box turtle and the snapping turtle. Samuel Hazard et al., Pennsylvania Colonial Records, vol. 5 (Philadelphia: published by the state; printed by J. Severns, 1851), 308-17. Carter makes relatively the same argument see Life and Times of Little Turtle, 42. Samuel Hazard et al., Pennsylvania Colonial Records, vol. 5 (Philadelphia: published by the state; printed by J. Severns, 1851), 670-89. La Tortue (the Turtle) shows up in the record throughout the 1740s and 1750s. The last known citation of him comes from 1755. This is quite likely the same man who was at Lancaster in 1748 and Carlisle in 1753. The 1755 reference comes from Sylvester K. Stevensand and Donald H. Kent, eds. Journal of Chaussegros de Lery, Northwestern Pennsylvania Historical Series, Pennsylvania Historical Commission, Harrisburg, 1940, 88-89. Relevant portions of the journal can be found online here, at the Glenn A. Black Archeology Labs Ohio Valley-Great Lakes Ethnohistory Archives. Brant & Fuller, History of Miami County, Indiana: From the Earliest Time to the Present, with Biographical Sketches, Notes, etc., Together with an Extended History of the Northwest, the Indiana Territory, and the State of Indiana (Chicago: Brant & Fuller, 1887), 254. Can be found here on Google. – James Buss summarizes the role of county histories at the centennial moments of the U.S., various states, and local municipalities and clearly identifies the challenges of using such histories as historical sources. James Joseph Buss, Winning the West with Words: Language and Conquest in the Lower Great Lakes (Norman: University of Oklahoma Press, 2011), 183-88. The professionalization of the field of history in the U.S. is usually described as beginning with white male historians who received their training in Germany in the mid to late 1800s. The first stateside program opened at John Hopkins in 1876. Francis G. Couvares, et al, eds., Interpretations of American History: Patterns & Perspectives, 7th Edition (New York: The Free Press, 2000), 6-7. Among the Ojibwe it was also rare for sons to carry the same name as their fathers. This begins to change in among the Ojibwe in the mid-1800s as sons sought to reference the legacies of their respective fathers through naming. For examples of this, see Anton Treuer, The Assassination of Hole in the Day (St. Paul, MN: Borealis Books-Minnesota Historical Society, 2011), 83-84. This change seems to have no parallel among the Myaamia as none of the sons of Mihšihkinaahkwa (the younger) take his name after his death in 1812. To the best of our knowledge, there are no examples of Myaamia sons taking their father’s name after his death. However, American documents from the early to mid-1800s constantly reference the parentage, specifically the fathers, of various young men who held positions of leadership. Perhaps because the Americans knew these connections so well among the Myaamia, there was no need to highlight one’s parentage through the taking of a father’s name? Carter, Life and Times of Little Turtle, 38-39. I enjoyed your article. I have been doing research on my family and am finding it difficult to locate Chief Paccane information. your article answered why.